Research continues to investigate barriers to managing occupational health and safety behaviors among the workforce. Recent literature argues that (1) there is a lack of consistent, multilevel communication and application of health and safety practices, and (2) social scientific methods are absent when determining how to manage injury prevention in the workplace. In response, the current study developed and tested a multilevel intervention case study at two industrial mineral mines to help managers and workers communicate about and reduce respirable silica dust exposures at their mine sites. A dust assessment technology, the Helmet-CAM, was used to identify and encourage communication about potential problem areas and tasks on site that contributed to elevated exposures. The intervention involved pre- and post-assessment field visits, four weeks apart that included multiple forms of data collection from workers and managers. 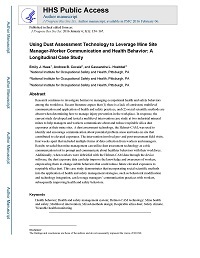 Results revealed that mine management can utilize dust assessment technology as a risk communication tool to prompt and communicate about healthier behaviors with their workforce. Additionally, when workers were debriefed with the Helmet-CAM data through the device software, the dust exposure data can help improve the knowledge and awareness of workers, empowering them to change subtle behaviors that could reduce future elevated exposures to respirable silica dust. This case study demonstrates that incorporating social scientific methods into the application of health and safety management strategies, such as behavioral modification and technology integration, can leverage managers’ communication practices with workers, subsequently improving health and safety behaviors.